Safety is a primary concern that must be addressed before humanoid robots can freely exist in human surroundings. Out of a number of possible situations where safety becomes an issue, one that involves a fall is particularly worrisome. Fall from an upright posture can cause damage to the robot, to delicate and expensive objects in the surrounding or to a human being. Regardless of the substantial progress in humanoid robot balance control strategies, the possibility of a fall remains real, even unavoidable. Yet, a comprehensive study of humanoid fall and prescribed fall strategies are rare. One can ignore the possibility of a fall and wishfully hope that its effects will not be serious. However, failure studies, such as in car crash, have taught us against behaving according to this instinct. In fact, planning and simulation of failure situations can have enormous benefits, including system design improvements, and support for user safety and confidence. Following this philosophy we closely focus our attention to the phenomenon of humanoid fall and attempt to develop a comprehensive control strategy to deal with this undesired and traumatic ``failure'' event. Humanoid robot falls among multiple objects. With no control, the robot nmay hit an object. 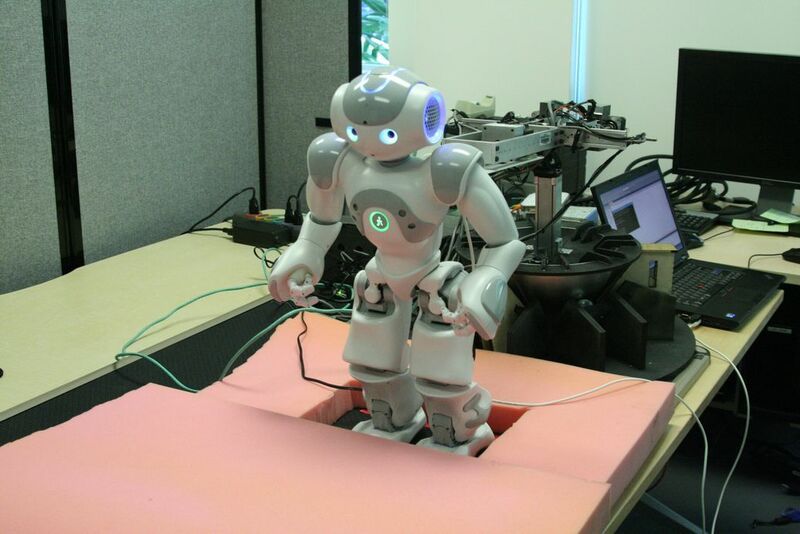 Humanoid robot can successfully avoid hitting surrounding objects using a fall controller. 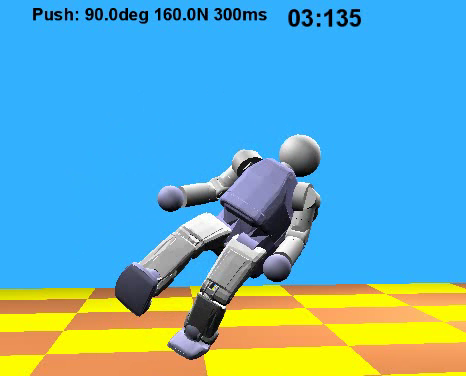 A humanoid fall may be caused due to unexpected or excessive external forces, unusual or unknown slipperiness, slope or profile of the ground, causing the robot to slip, trip or topple. In these cases the disturbances that threaten balance are larger than what the balance controller can handle. Fall can also result from actuator, power or communication failure where the balance controller is partially or fully incapacitated. We currently consider only those situations in which the motor power is retained such that the robot can execute a prescribed control strategy. 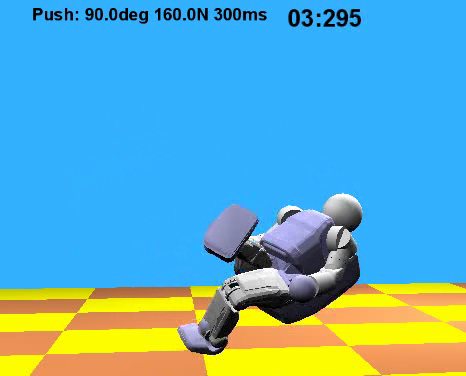 A fall controller can target two major objectives independently or in combination: a) fall with a minimum damage and b) change fall direction such that the robot does not hit a certain object or person. Here we introduce a strategy for fall direction change and describe a controller which can achieve both objectives. Let us note that a fall controller is not a balance controller. A fall controller complements, and does not replace, a balance controller. 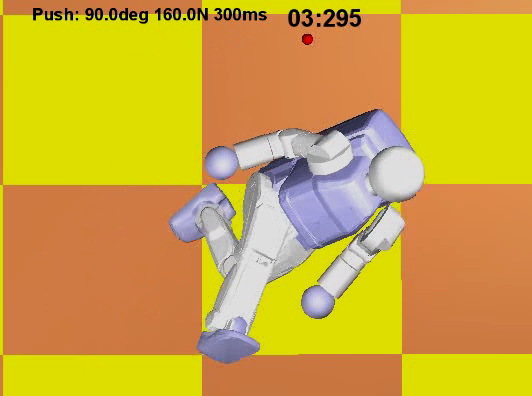 Only when the default balance controller has failed to stabilize the robot, the fall controller is activated. Further, a fall controller is not a push-recovery controller. A push-recovery controller is essentially a balance controller, which specifically deals with external disturbances of larger magnitude. 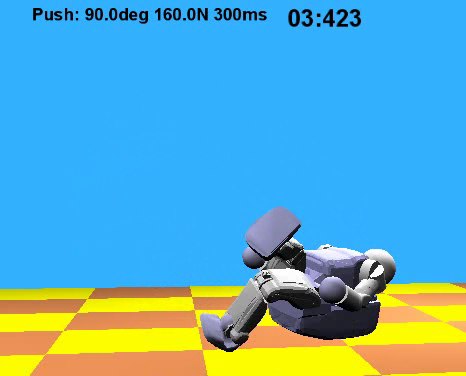 A robot can recover from a push e.g., through an appropriate stepping strategy. 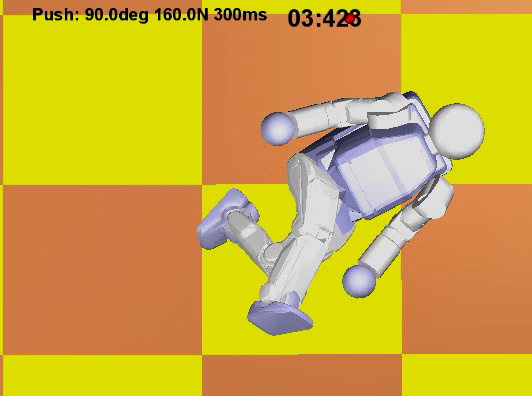 We propose a fall strategy which rapidly modifies the fall direction of a robot in order to avoid hitting a person or an object in the vicinity. Our approach is based on the optimal modification of the support base geometry of the robot through intelligent stepping. Additional improvement to the fall controller is achieved through inertia shaping technique aimed at controlling the centroidal rotational inertia of the robot. 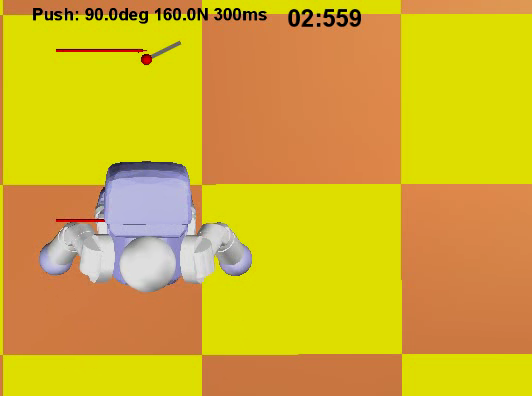 The video is composed of two simulation animations which show the falling motion of an Asimo-like humanoid robot. 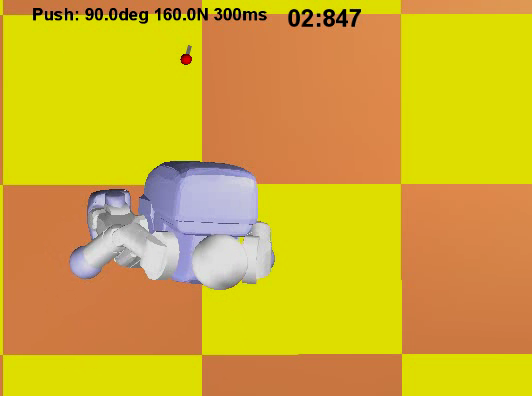 In the first simulation only the footstep controller is active. 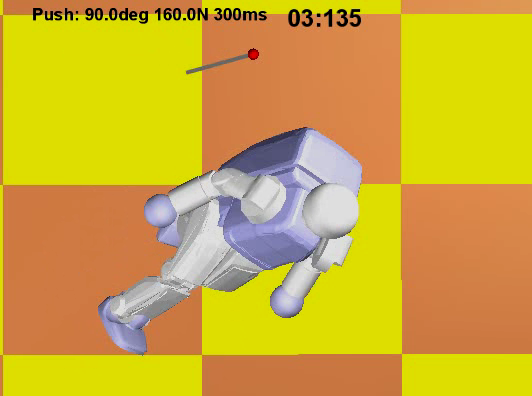 In the second animation, the inertia shaping controller is activated as soon as the humanoid makes a foot touchdown. 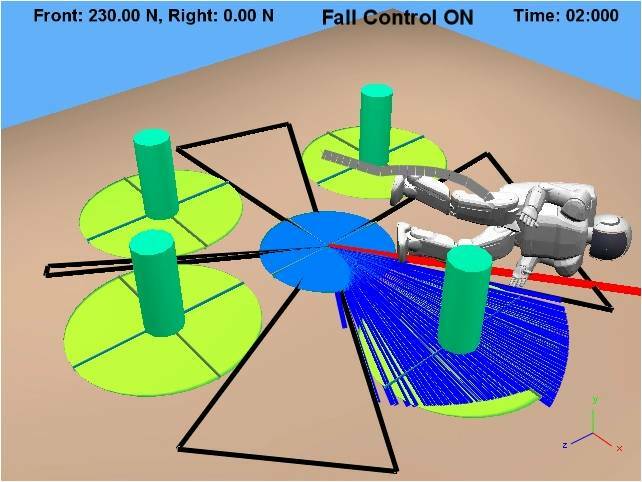 This paper reports successful experimental demonstration of damage-reducing fall control strategy of humanoid robots. ICRA 2012, St. Paul, MN, May 2012. 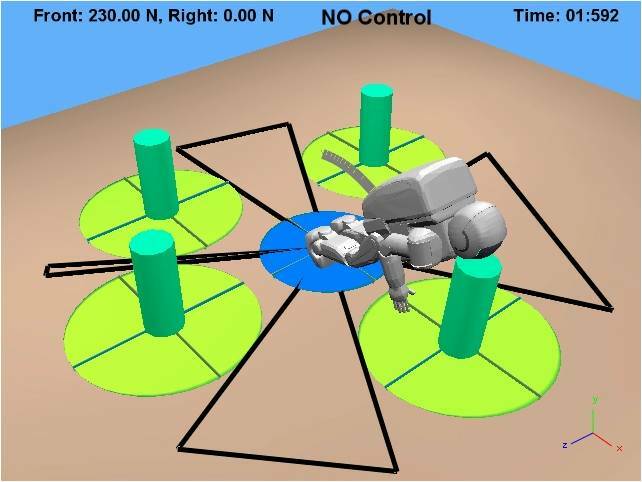 This paper reports successful experimental demonstration of direction-changing fall control strategy of humanoid robots. ICRA 2010, Anchorage, Alaska, May 2010. We have earlier presented such a direction-changing fall controller, see here. However, the controller was applicable only when the robot's surrounding contained a single object. 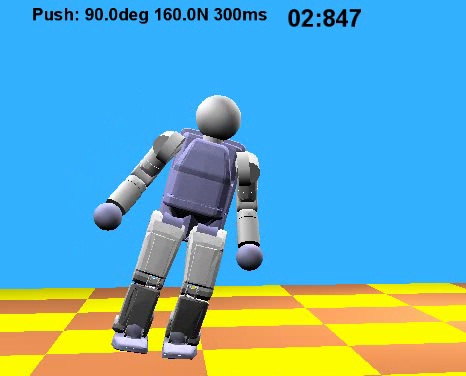 In this paper we introduce a generalized approach to humanoid fall-direction control among multiple objects. This new framework algorithmically establishes a desired fall direction through assigned scores, considers a number of control options, and selects and executes the best strategy. The fall planner is also able to select "No Action" as the best strategy, if appropriate. The controller is interactive and is applicable for fall occurring during upright standing or walking. The fall performance is continuously tracked and can be improved in real-time. 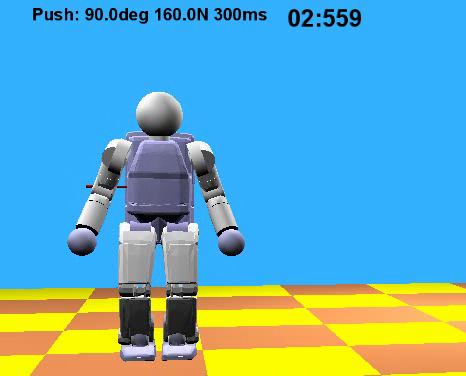 The planning and control algorithms are demonstrated in simulation on an ASIMO-like humanoid robot.